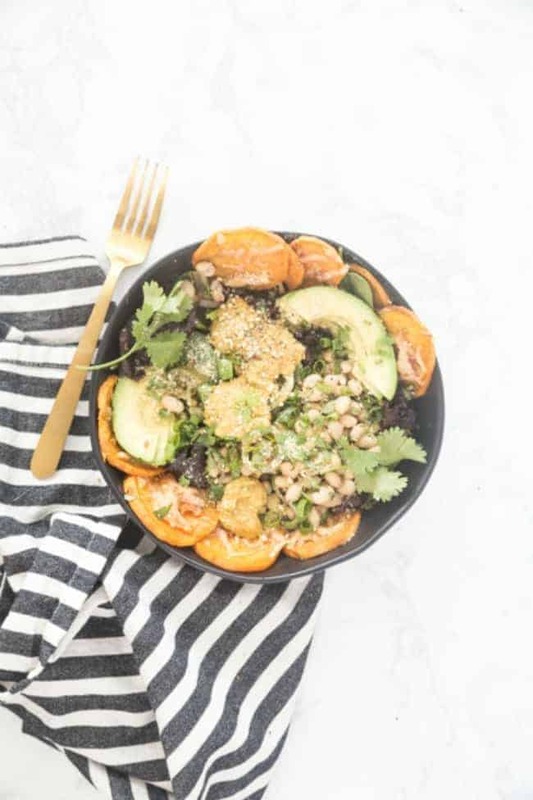 Sometimes you’re craving Sweet Potato Nachos and sometimes you’re craving a healthy nutritious bowl of goodness. Now you don’t have to compromise with this Loaded Sweet Potato Nacho Salad Bowl. Let me tell you about the time I completely hoarded a bowl of sweet potato nachos from my wife and tried to get away with it. This is what happened. 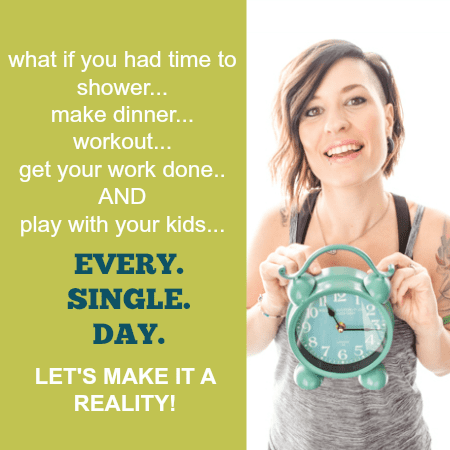 We came home from Spring Break vacation, which included zero working out and lots of girl scout cookies, late night snacking, and going out to eat every meal. To say I was craving healthy food and healthy moves for my bod is a total understatement. And just like the universe was listening, I opened my mailbox the day we returned and was greeted by the most beautiful cookbook from my friend Lindsay of Cotter Crunch. 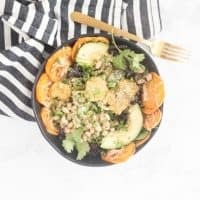 Her book, Nourshing Superfood Bowls is exactly what I needed, and I couldn’t wait to open it up and get cooking all of these beautiful bowls up! Biggest problem though. How to know what to make first?? Gah, doesn’t everything just sound so nom?!!! I wanted to make every single recipe in the book. Honestly, you have got to get yourself a copy of this cookbook asap! I ended up going with Lindsay’s Sweet Potato Nachos Salad Bowl first, and boy it did NOT disappoint. So back to the part when I hoarded this salad bowl all for myself. This time, I omitted this particular recipe. I had already eaten one of the 2 servings for lunch and usually would have no problems with sharing the rest of it with my family… but this one was different. There was no sharing. I had already put it away, hid it in the back of the fridge, and mentioned no word of it. I was looking forward to lunch the next day already! But y’all. 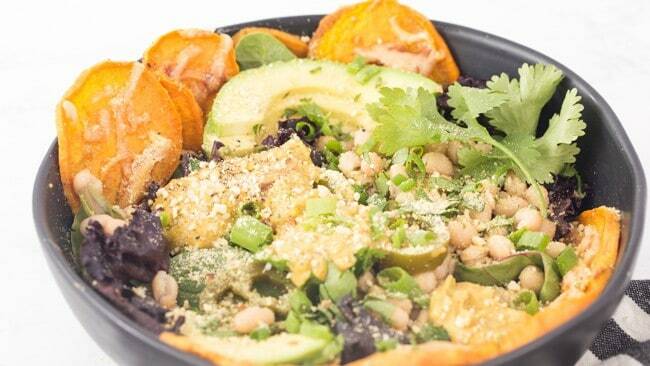 This sweet potato nachos bowl is insane and you won’t want to share either. But you’re probably better person than I am and will most likely share with your family… but if you don’t, don’t worry, I won’t judge. 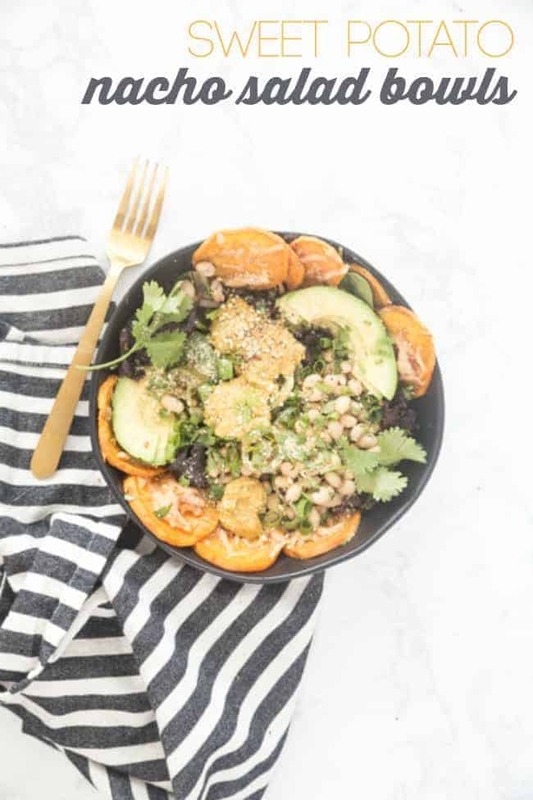 Thankfully, Lindsay’s recipes are easy and attainable that I can make this super impressive-looking salad bowl over and over again without spending hours in the kitchen. I’ll definitely be making this again, and I promise I’ll share with my wife this time! Hey, are you a visual learner like me? I made you a video of the Sweet Potato Nachos Salad Bowl so you can see just how easy it is to make! 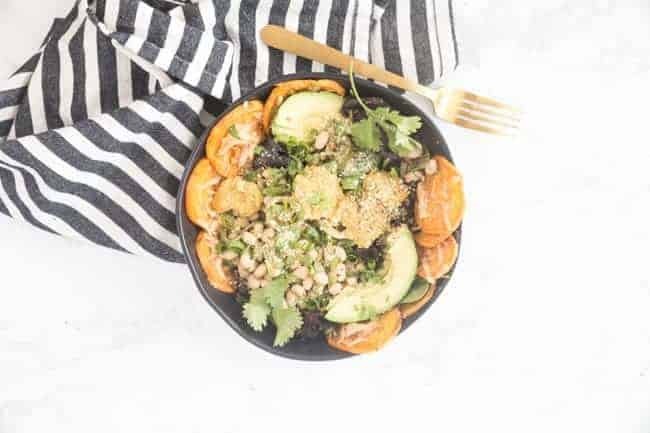 This salad bowl is the perfect nourishing meal when you're craving the flavors of loaded sweet potato nachos. Preheat oven to 400 degrees F. Line a baking sheet with foil or spray with non-stick cooking spray. To make the sweet potato chips, toss the sweet potato slices with olive oil, salt, pepper, and garlic powder. Place sweet potatoes on the baking sheet and sprinkle the non-dairy cheese on top. Bake for 20 minutes or until the cheese is melted and the edges of the sweet potatoes are crispy. Boil for the last few minutes for extra crispy chips. Remove and let cool slightly. While the sweet potatoes are cooking, prepare the Avocado La Crema sauce by combining all sauce ingredients in a food processor or blender and processing until smooth. To assemble bowls, divide the sweet potato chips evenly between the two serving bowls. Top with the greens, beans, and avocado. Top each bowl with jalapeno, green onions, and cilantro. Season with salt and pepper, to taste. Drizzle on the sauce. Sprinkle with the Parmesan or nutritional yeast and crushed red pepper flakes, if desired.